The Multi-Purpose Neck Phone Holder is perfect for those who get tired of holding up their phone. Browsing the internet, watching Netflix or any other phone intensive task makes your arms tired after a while and it simply is not comfortable for extended periods of time. This phone holder straps your phone right in and hangs around your neck so you’ll get the best view while being hands-free. 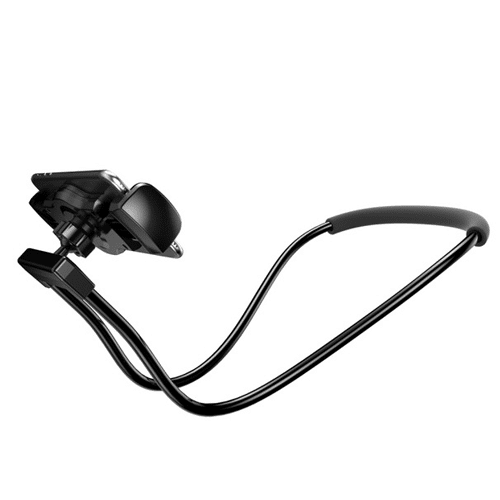 As you can see the actual neck phone holder mount can be rotated as you want. It also has a nifty knob to tighten your adjustment, giving you the most comfortable position. The shaft is totally bendable and you can create awesome shapes such as stands or selfie sticks with it. 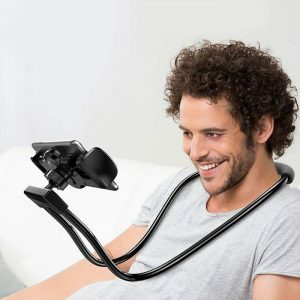 It really is a one solution arm that can form into multiple useful stands that will improve your overall phone viewing life quality. 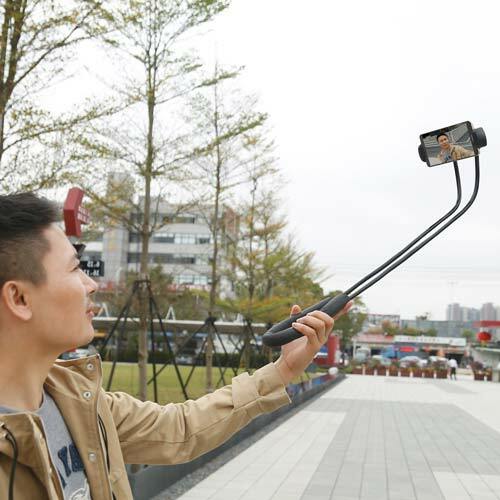 It can also transform into a selfie stick or a phone stand and holder. Free Shipping. 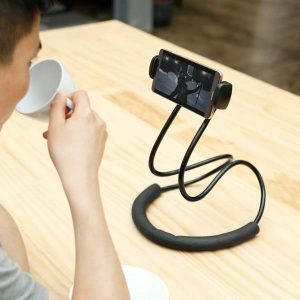 FLEXIBLE PHONE HOLDER: Includes a highly versatile flexible phone holder that gives you hands-free access to your phone! VERSATILE HANDS-FREE USAGE: Hang it on your neck, wrap it around your waist, use it as a table stand or selfie stick. The flexible but semi-rigid material of the lazy bracket lets you use your phone hands-free in many various ways. PIVOTING MOUNT: The cell phone mount pivots in order to provide ideal viewing angles. FOAM COVERED BASE: The black foam covered base provides extra comfort for hanging around your neck as well as anti-slip properties when used as a table stand. DIMENSIONS: Holds smartphones with screen sizes ranging from 4 to 6.3 inches. The phone mount holds phones with a minimum length of 4.5 inches and expands up to 7.5 inches. The standing adjusted size measures 10 x 13.5 x 5.5 inches.